Baraka Books is pleased to announce that The Raids, Vol. 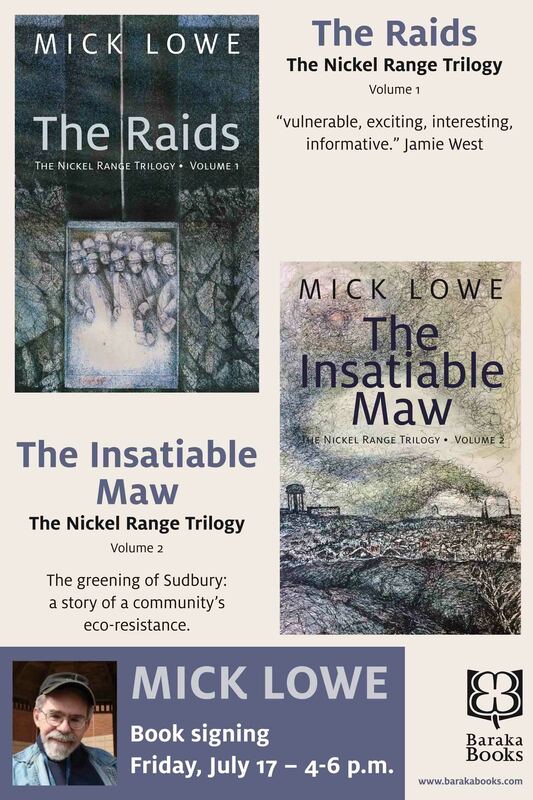 I of The Nickel Range Trilogy, by Mick Lowe of Sudbury will be published in German by Verlag Edition AV in time for the Frankfurt 2020 Book Fair which will showcase literature from Canada. Following The Raids (2014), Baraka published Vol. 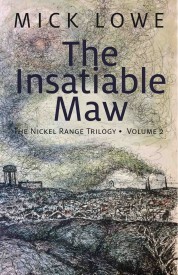 II The Insatiable Maw (2015), which tells how Sudbury miners and smelter workers fought the company in the early 1970s to clean up the poisonous air they had to breathe and at the same time change the city’s lunar landscape from red-brown to GREEN. Wintersong (2017), third and final volume of The Nickel Range Trilogy, is a fictionalized account of the epic 1978-79 strike pitting some 12,000 workers and their families against the nickel giant Inco. 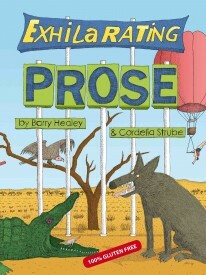 Covers art and illustrations are by Sudbury artist Oryst Sawchuk. 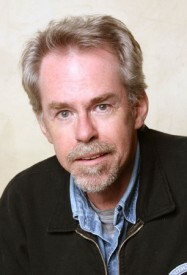 Mick Lowe, born in the United States, is a prolific journalist, writer and newspaper columnist who adopted Sudbury as his home. 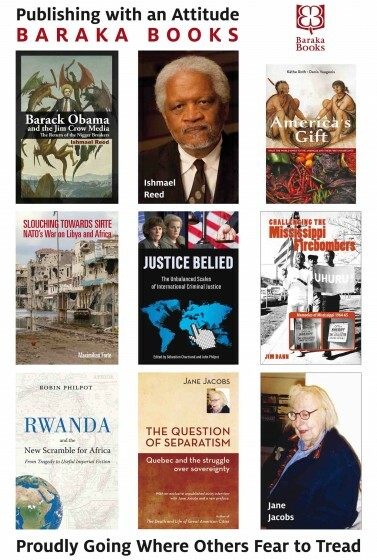 Baraka Books is a Quebec-based English language publisher specializing in creative and political non-fiction and fiction. QC Fiction, headed by Fiction Editor Peter McCambridge, is our imprint dedicated to publishing the very best of a new generation of Quebec storytellers in flawless English translation. 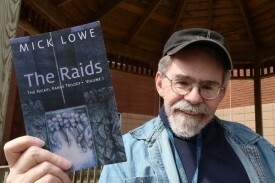 Asked to review Mick Lowe’s new book, The Raids, I have taken the time out to go over it a second time. 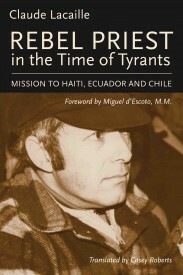 I have known Mick as a friend since the days in 1975/76 when the two of us were reporting on the so-called “Carnation Revolution” in Lisbon, Portugal; he was a meticulous journalist then, and he is a meticulous writer now. For all that his venue has changed in the intervening years, Mick writes like a pro, putting his story together piece-by-piece in the way a good newsman assaults any series of stirring events. 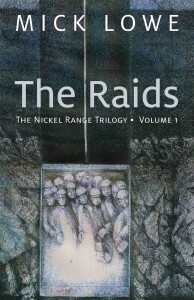 The Raids is the first thrilling portion of a Canadian saga – The Nickel Range Trilogy – set, of all unlikely places, in Sudbury, Ontario. Which is Mick Lowe’s very clever and precise point: tough, outback working Canada, little known to Canadians for anything more than its gigantic smelter smokestack and the mountains of mining slag that seem to engulf an unappealing grey town. In recent years Sudbury has been transformed. 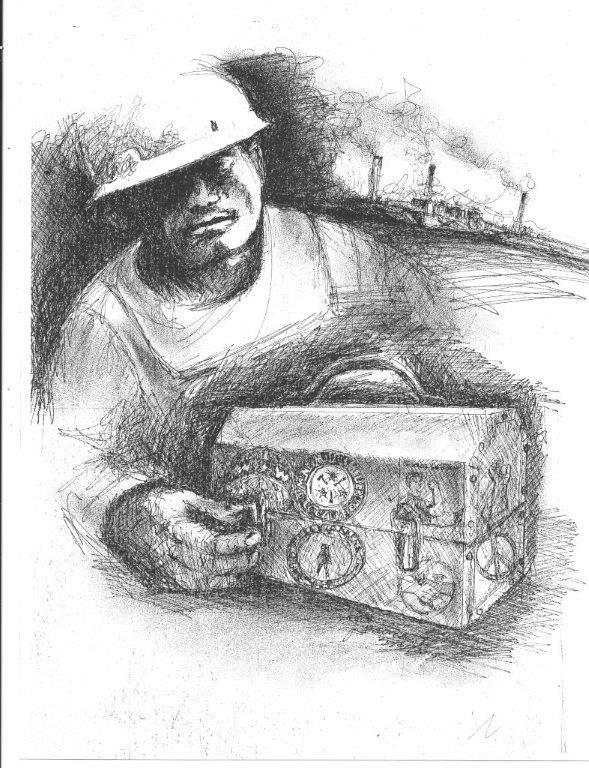 It is a well-ordered garden city now that the operating methods of the mines have themselves been significantly transformed – a great deal of which Mick Lowe describes in fascinating detail as he builds the story line of a mining family. 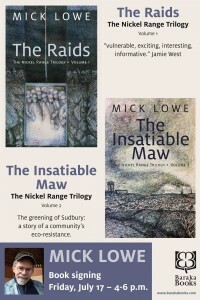 There is a strong socio-political element to the story – events of Mick Lowe’s fertile imagination, but events that only slightly push the boundary of a reality that actually existed well within the lifetimes of current Sudbury residents – and which persist almost everywhere else to this very day in areas where there are determined and greedy bosses, and desperately determined workers. 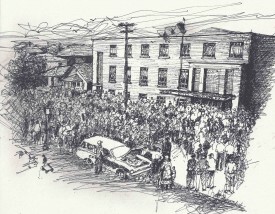 Anyone who has spent time in this fascinating corner of Canada’s northern Ontario – or any other mining town in the country – will be able to identify with The Raids’ plot and story line, but the book is far more than the usual pedantic regional tale so many Canadians feel beholden to lap. It goes to the heart of the tensions so often consciously built to maintain a worker-management tension – an imbalance almost tailor-made to pander to friction. 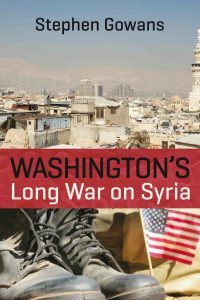 It portrays on a minuscule (but understandable) scale, the old “divide-and-conquer” rule used by so many grasping “colonizers” that makes it easy to see and measure – money, local power elites and the desperation of the job-related eagerness of men and women who, in order to maintain their own short-sighted equilibrium, instead bolster the absentee landlord and his fat bank account. 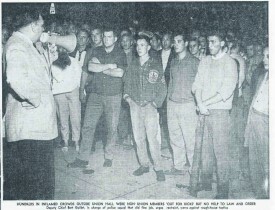 The Raids is quite a tale – well told, and with more to come. 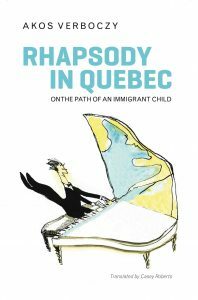 It is a far cry from so much of Canada’s literary parochialism, a book that successfully aspires to contribute to a genuine and important Canadian – and universal – dialog. 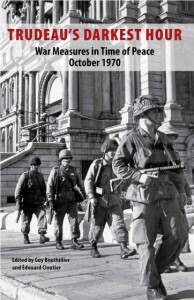 * Jeremy Hespeler-Boultbee is a writer, journalist, and architectural historian. He considers home to be Victoria BC, Canada, Barrancos, Portugal, and Bahir Dar, Ethiopia. 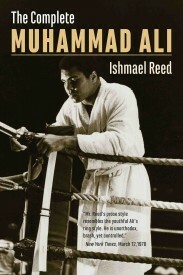 His most recent book is Mrs. Queen’s Chump, CCB Publishing, 2012.